Best Animation Category: Number Two – dir. Michelle Catalanotto, Albuquerque, TRT 3 min. Two solitary forest creatures prove how far they will go for friendship. Bio: Michelle Catalanotto is a traditional animator who strives to convey a whimsical and magical feel in her creations. As someone who tends to absorb the gloom of the world more than she would like, Michelle tries to create worlds and silly characters that give her (and hopefully the viewers) a reason to chuckle or smile. Best Comedy Category: The Matter of Magic – dir. Anna Darrah, Santa Fe, TRT 14 min. 47 sec. This short film stars Colin Cunningham (Falling Skies) as Sam, an ad man who hasn’t slept in a week due to the stress of an upcoming presentation. His wife has had enough. His boss is putting on the pressure. And Sam feels like he’s losing his mind. Especially because lately, when Sam reaches for something like a pen or his razor, they seem to fly into his hands of their own accord. Bio: Anna Darrah has been licensing films for Spiritual Cinema Circle and Gaiam, since 2004. She has worked with the Santa Fe Film Festival, the Screenwriting Conference in Santa Fe, been on many film festival panels and written a chapter in the book, Swimming Upstream; A Lifesaving Guide to Short Film Distribution. Anna is currently working on a feature length documentary, www.TheHelenMovie.com. Best Documentary Category: A Horseback Ride to the Soul – dir. Aimee Barry Broustra, Santa Fe, TRT 28 min. For the rider and non-rider alike, A Horseback Ride to the Soul explores the ways in which humans and horses interact and how better understanding of this relationship leads to a deeper knowledge of ourselves and our relationship with the world. Bio: Aimée Barry Broustra, of Camino Vérité Films, has produced, directed and written A Horseback Ride to the Soul and The Young Ancestors. Both documentaries were filmed in New Mexico. Best Drama Category: Ballad of the Boatman – dir. Andy Kastelic, Albuquerque, TRT 23 min. The Boatman is growing weary of his post as the toll taker and ferryman into the afterlife. The faces he sees and the stories he hears are wearing him down. When someone very dear to him shows up at his post, the Boatman must decide whether he can continue his current job as a player in the system or take up arms against a sea of troubles. Bio: Andy Kastelic is an actor, writer and director who studied theatre at Eastern New Mexico University, and acting at the Lee Strasberg Institute of Theatre and Film in Los Angeles. He now sits as creative director at Balian Pictures. Andy strives everyday to bring compelling, fresh and entertaining stories to the screen. Production Company and Filmmaker Website: www.balianpictures.com. Best Experimental Category: This is Me – dir. Marcus Romero, Albuquerque, TRT 4 min. The film illustrates the ideology behind the loss of childhood and the development of adulthood. Bio: Marcus Romero was born in Santa Fe, New Mexico, where much of his filming is done. He is currently taking classes through Eastern New Mexico University, where he hopes to get a Film Degree. Best Horror Category: The Carving – dir. Benjamin Pierce, Portales, TRT 4 min. Hal and his protégé undertake a grotesque experiment in the spirit of Halloween. Bio: Benjamin Pierce is a senior film student set to graduate this May 2015 from Eastern New Mexico University. He first caught the film bug in his senior year of high school. Over the course of his budding career, Ben has been a production assistant on multiple sets, made his own short films, and had an internship. Benjamin is working toward the goal of becoming a director. Best Other Category: S.H.I.L.O. Good Times – dir. Dusty Deen, Roswell, NM TRT 3 min. 20 sec. The music video for S.H.I.L.O’s “Good Times” was created from 2,380 original artworks from over 500 artists, almost half of them Junior High students. The original video was shot and cut and then exported as individual images. Each image was printed, in black and white, and artists used oil pastels, markers, and paint to color the image as they chose. The images where then photographed and sequenced over the original frames creating a unique and surreal experience. Bio: Dusty Deen is an Emmy nominated artist with an emphasis in filmmaking. His recent endeavors explore individual interpretations of persistence of vision when shown unique images of the same representation, as well as stop-motion animation. More of Dusty’s work can be seen at www.RedRoadrunner.com. Best Sci-Fi/Fantasy Category: Death in Time – dir. John Broadhead, Albuquerque, TRT 45 min. Time and Death, both personified, engage in an eternal argument over the meaning of death and the value of life. 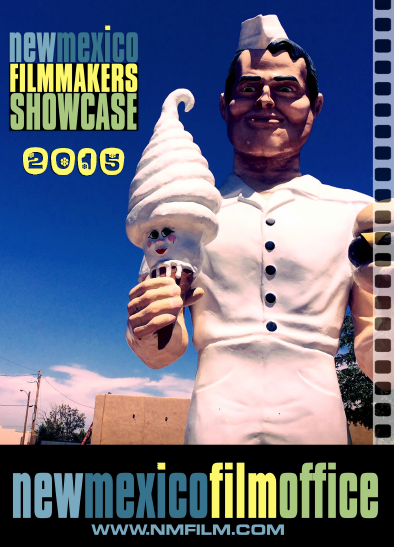 Bio: John Broadhead is a New Mexico native who has been writing, directing and editing films for over ten years. He is currently a producer with his film company, Reflection Films, based in Albuquerque.